Dallas Jumbo single makes 9 lbs meat - Spicy East Texas ranch house taste. Made for Beef but good on Chicken too! A smoky Texas Ranch house flavor that helps you feel like you are in the heart and heat of Dallas. 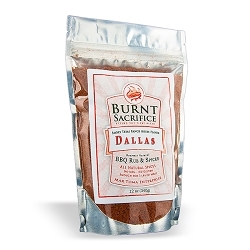 Burnt Sacrifice Dallas BBQ rub makes you feel like you are sitting in Dallas in the summertime with a large jar of iced tea. Now you can have that great ranch house east-Texas taste. Just imagine rubbing up that brisket and slow cooking it so it's moist and tender, and the smell driving you crazy from the wonderful New Mexico chili powder and garlic. Then after it cools, with fevered BBQ anticipation, you taste your first bite. Your brisket has bark from the real brown sugar, but you are pleasantly surprised at the lemony cumin, the acidity and pungence of the paprika and black pepper. Then the tongue gets to the Mexican oregano finish. It's our spiciest dry rub and goes well on any cut of beef or pork, but it's specially created for denser cuts like brisket. It also works well with chicken and fish. It will lightly tenderize the meat to unlock the hidden flavor that only comes with good BBQ. Dallas is the beginning of the beef trail which leads to the Kansas City stockyards. 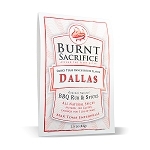 So, keeping true to the Dallas style, a little bit sweet, a little bit spicy, and some real smoke flavor make this rub a great choice for meat no matter how you intend to cook it. 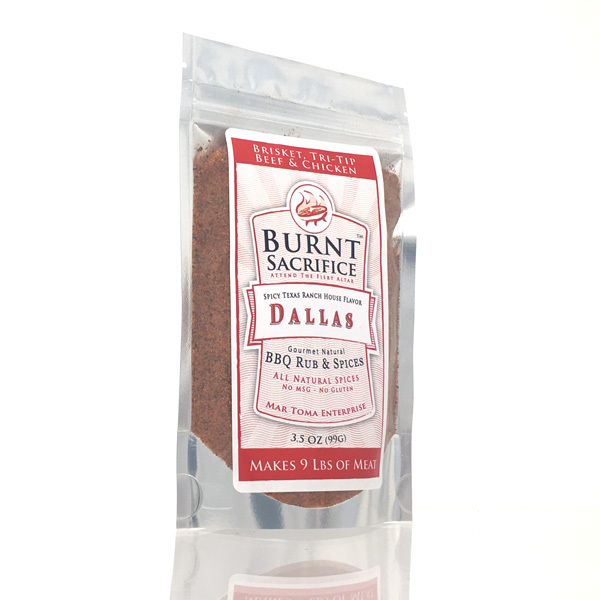 Rub on some of our Dallas Rub and let the meat sit in the refrigerator for a few hours or even overnight. You will be amazed at the meaty flavor that explodes onto your tongue and takes over your mouth. Now that is what summer in Dallas is all about! Every BBQ competitor and every BBQ restaurant starts with a BBQ rub or Dry Rub. The foundation of all great BBQ or grilling begins with your rub. The basic spices of the rub will enhance the flavor of whatever you are cooking, and also modify the flavor of the sauce. This gives you the effect of a different sauce for each rub you use. Try one of our fantastic Burnt Sacrifice competition-class sauces, available in several spice levels, to finish our rubs or use as a dipping sauce. Our rubs are specifically designed to be bold enough to stand up on their own so you can enjoy the flavor of the meat, but will also work well to enhance the BBQ sauce.